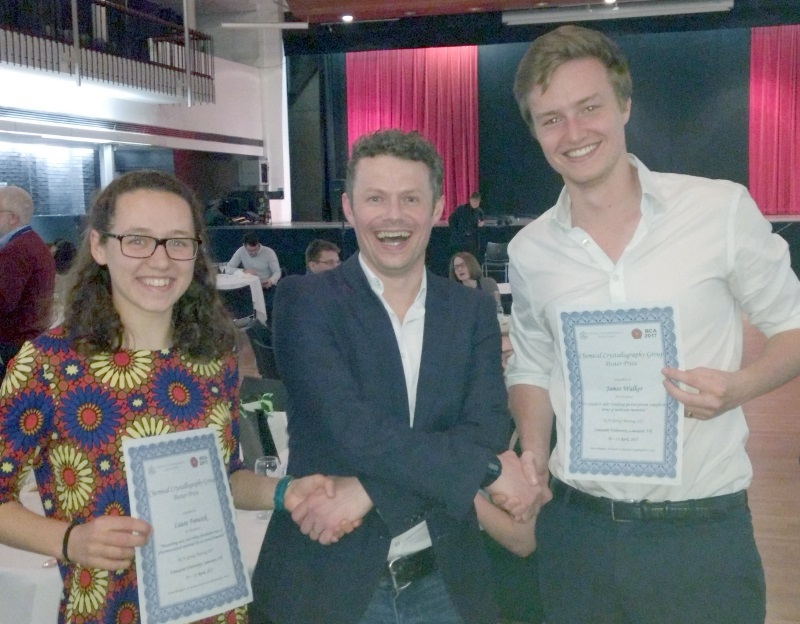 Congratulations to Part II students Laura Fenwick and James Walker who both won poster prizes awarded by the Chemical Crystallography Group of the British Crystallographic Association at the Annual Spring Meeting in Lancaster. Laura’s poster “Measuring and controlling dissolution rates of pharmaceutical materials by co-crystal formation” reported dissolution rate studies of tablets of pure paracetamol and co-crystalline forms, and shows a significant increase in dissolution rate of the active ingredient for certain formulations. James’ poster “Co-crystal or salt? Studying partial proton transfer in a series of molecular materials” reported several crystalline materials which exhibit transfer of a single proton between a significant fraction of the molecular pairs, resulting in a crystal on the borderline between co-crystal and salt.